Back in March, I was approached by WedLuxe, a Canadian magazine with high-end wedding clients, to participate in one of their editorial spreads. At the time, I was in the process of designing and making the paper floral display at The Paper Place, so I had offered to use that for the shoot. They also asked for a headpiece for one of the models to wear. In the end, they decided to go in a different art direction for the shoot, sticking with whites and light light pastels, so we did not end up using the large floral ring which had too much green in it. I based it’s size on inspiration photos provided, and built it as large and crazy as possible. I used a cheap headband that could grip onto the hair with small teeth. I covered it with white floral tape and attached the branches of magnolias in different stages of maturity and leaves to it in all directions. It looked ridiculous when I tried it on. I could hardly walk through doors. But, apparently, the crazier, the more “editorial”! 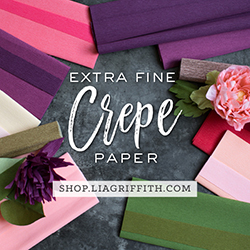 To create the extra large magnolia blooms with diameter of about 10″, I had to stiffen the paper by fusing white doublette crepe paper with 100 g crepe paper. I then sprayed the strips of fused crepe paper with Design Master in Perfect Pink along one edge to create an ombre effect. I cut the petals into the shapes and sizes I wanted. Before shaping the petals, I placed them under a hot iron again to melt the fuse so it was easier to stretch and cup. Once cool, the petals kept their shape wonderfully. I finished the headpiece with white leaves. I felt so out of my element when I was making this. It was so different from what I normally do, which is seek to faithfully interpret nature. This was an interpretation where the sum of its parts was the inspiration. In reflection, I wish I had been on set to just tweak the headpiece a bit on her head, to show off the other flowers more and really emphasize the 3-dimensional elements that I had strived to define when I was assembling it. Oh well. An overall worthwhile experience overall. I’m SO thankful to have been able to contribute my work to this magazine.